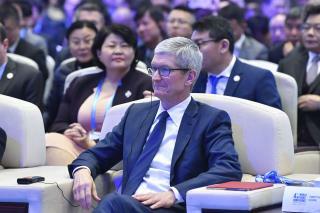 (Newser) – The pay cut that CEO Tim Cook and other Apple execs received after a rare slump in sales last year has been reversed—and then some. According to a Wednesday filing with the Securities and Exchange Commission, a cash bonus for exceeding the board's sales and profit targets boosted Cook's total compensation for 2017 to $12.8 million, marking a 47% year-on-year rise, the Wall Street Journal reports. That includes his salary of $3 million, bonuses of around $9.3 million, and other forms of compensation. A previously disclosed equity award of $89.2 million makes Cook's total for the year more than $100 million. Cook got his now, but probably not next year when Apple will be ordered to give out pay vouchers to every older Iphone owner to purchase new batteries for their phones. I hope that he enjoys that big money this year.... NOT! Companies are hiding record profits overseas and yet the GOP thinks they'll take the latest Government windfall and use it to increase productivity and hire people. Like AT&T did, laying off over 2,000 people. This is exactly why big tax cuts to large corporations (in a good economy) won't work. They will continue to give bonuses to the executives with the extra money they have on hand.